If you’re involved with running an amateur radio club in the UK, you’re probably aware that there’s a deadline fast approaching… The 25th of May 2018 is the date for compliance with the new GDPR legislation. As there’s surprisingly little out there in the form of help and advice for clubs, I thought I’d put up this page to summarise my understanding, and to get some thoughts from other clubs looking to get compliance by the 25th of May. 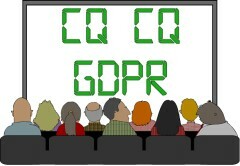 This page will be updated based on feedback, and suggestions in our new GDPR discussion group. Disclaimer – I’m no lawyer. This is my personal take, based on reviews of material discovered online, and information received at a GDPR workshop I attended in April. Please make your own decisions! This stands for General Data Protection Regulation, and is a “beefing-up” of the UK’s Data Protection Act 1998. It relates to collecting, storing, protecting, using and sharing personal data, and has a much wider scope (and tougher penalties) that the old Data Protection Act. Does GDPR apply to amateur radio clubs? from my understanding, “yes”. Amateur Radio clubs that hold personal data need to be compliant by the 25th of May. GDPR applies to everyone (individuals, groups, companies) who is “processing personal data”, unless the information is for household/personal use only. What club data do we need to worry about? What do clubs need to do? The first step appears to be to audit the data that you hold. What information does your club hold? Do you need it? Who can access it? Is it safe? Was consent given? Do you still have a valid reason to keep it? Will your club be ready for GDPR by 25 May 2018? What happens if our club is not compliant? Potentially, fines. Whether the authorities would go after small hobby clubs, is yet to be seen! Which of the following contain personal data (name, callsign, etc), and therefore may be a GDPR concern? Callbooks & electronic callsign lookup databases. Can you opt-out? What is Essex Ham doing for GDPR? This impacts our membership database, mailing lists and online training. We’ve already completed a data audit and implemented some changes around consent. Expect a few more changes in the run-up to 25th May. No better time to promote the hobby? what about data in the callbook?